When I first saw The Wolf Man, I felt a little disappointed by it. I had heard people calling it one of the best horror films ever and it didn’t exactly meet up to my expectations then. After watching it a second time, however, I have changed my mind. 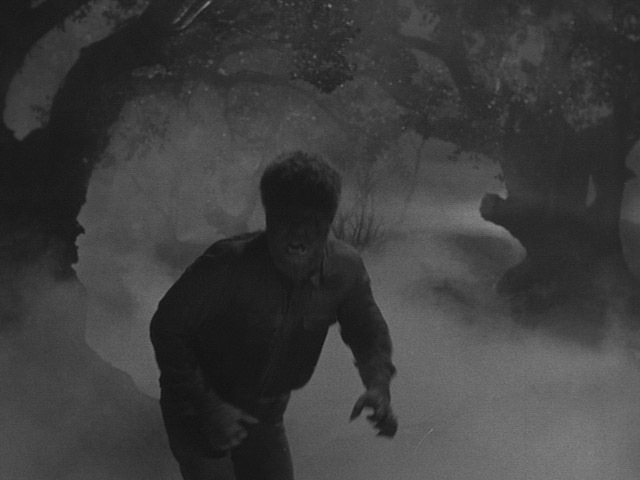 The Wolf Man is a true horror classic that lives up to films like Frankenstein and Dracula. It is not really a terrifying film but its one that will leave you trembling in your seat. The Wolf Man is about Larry Talbot (Lon Chaney Jr.), who goes to Wales to meet with his father Sir John Talbot (Claude Rains) after the death of his brother. While he is there, Lou falls in love with a local antique storeowner named Gwen (Evelyn Ankers). One night when he’s with Gwen’s friend Jen he encounters a wolf, which he beats to death with a walking stick after it bites him. And we all know what happens soon afterward… (okay, if you don’t know, Larry turns into a werewolf). The Wolf Man in a way reminds me of King Kong. Both films are technical marvels that audiences today can still appreciate. Though filmed on a budget of $180,000 (which would be much more adjusted for inflation), the movie must have been very high tech at the time. While The Wolf Man is not something that will really scare you when you watch it, it stays with you far afterwards and won’t go out. I had a similar experience with Night of the Living Dead and it’s clear what director George Waggner’s intention was. Not only is The Wolf Man a lot of fun to watch, but it’s sure to run chills down your spine. I didn’t understand this the first time around when I saw it but this viewing has really changed my mind. The Wolf Man is a great film that anyone from horror buffs to movie fanatics should see. I’ll be sure to fix it. Glad you loved it too and I think it’s a film everyone would like. Thanks for commenting.